Eating well isn’t about a fad diet, cutting down on essential foods like good fat, or eliminating major food groups; unless of course there’s a reason such as allergies, illness or you’ve chosen to become vegetarian/vegan. It’s about looking for the healthiest options when you’re prepping food for yourself and your family when you’re at home, taking a picnic or snack to work/school etc. If you take care of your choices, your bodies will thank you and days off – when you’re out, or away, and perhaps your usual foods aren’t available – become guilt free and perhaps less of a burden on your body in general. Open your cupboards and check out the packaged food with labels that contain ingredients you don’t understand. Give yourself a day to sweep through your kitchen and set aside the foods that you can consider eliminating from future shopping lists. Look in local health shops, the fresh aisles in your nearest supermarket and online, for the best deals. Supermarkets have times when they run huge discounts on certain foods. Find out from your local store when those deals are rolled out. Cut down on sugar consumption, including added sugar. Sugar is NOT our friend. 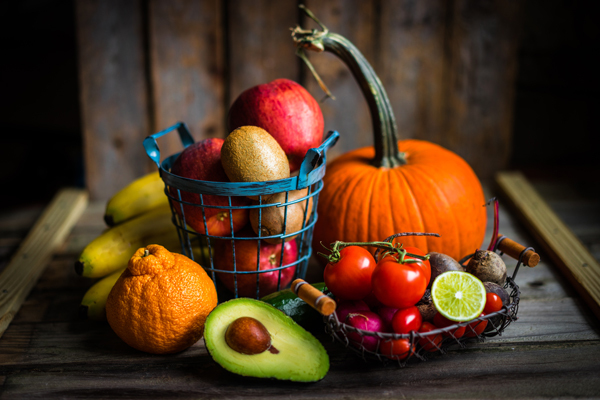 We all like a treat, but consider looking to ‘real’ food for your sweet fix most of the time and enjoy the benefit of the nutrients that nature’s own beautiful fruit offers, rather than eating something that offers no nutritional value. Check labels if you’re buying anything in a packet or bottle!! You may be surprised at just how many foods/drinks contain added sugar. It tots up very quickly! Embrace REAL food. Whole grains such as rice, buckwheat, quinoa (once the germ is removed during the refining process, you’ve lost your nutrients) butter, cream, healthy proteins (such as lean meat, fish, eggs), vegetables and fruits. Vegetables are full of vitamins and minerals and help to keep you full for longer. Experiment. Try new foods. If you don’t like them, seek out recipes that will help to mask the flavour. Don’t give up. It takes time to change habits – you may jump on and off board – but it’ll be SO worth it in the long run. Say goodbye to refined products such as white bread, cakes, biscuits etc. Buy whole grain bread (check the label – there are still many brands of brown and gluten free breads that aren’t at all healthy). If you need cake, bake a simple one at home. Ditch unhealthy salt and fat. It’s easy to switch to a good quality sea or Himalayan salt and organic oils (plus other good fats) and …. it’s back to those packaged foods again. They can be loaded with table salt. Re-stock your cupboards, fridge and freezer with food you can grab when you’re on the go. Hummus (fridge), flatbread (in the freezer), granola bars (in tins), fresh fruit (fridge) and a handful of unprocessed nuts or seeds (cupboards). Bulk buy online for discount purchases. Nuts/seeds have a long life so, if you’re feeding a family or bulk prepare food, this will save you some money. Look to eat al dente where possible. The less you cook, the more goodness you’ll be getting from your food. Soups, stews and casseroles retain nutrients because you are including the water in which they were cooked. Eat some raw food every day if you can too. It helps with digestion. Drink more water. We are 60% water. Water is vital to our function, brain health and survival. As a woman, look to take in around 2 litres a day; approximately 2.5 litres a day as a man, depending on weather, activity etc. We lose approximately this much water each day from breathing, sweat, and passing faeces and urine. That needs to be replenished. Cut back on alcohol consumption. It’s another sugar and will add empty calories to your diet. Remember that many bottled drinks are also full of colour, preservatives, and unwelcome sugars. Remember to add extra water to your daily intake when you drink alochol, since it’s dehydrating. Extra note: If your children are crazy for fizzy drinks, you could make them healthy sodas by adding a little fruit juice (or better: blended fruit) to carbonated water. Yummy! Don’t forget to keep moving. Static isn’t good. It can be hard if you’re not well, but at least try to move about every hour and keep your lymph healthy. What are you changing today, to eat yourself well?